Hello everyone! 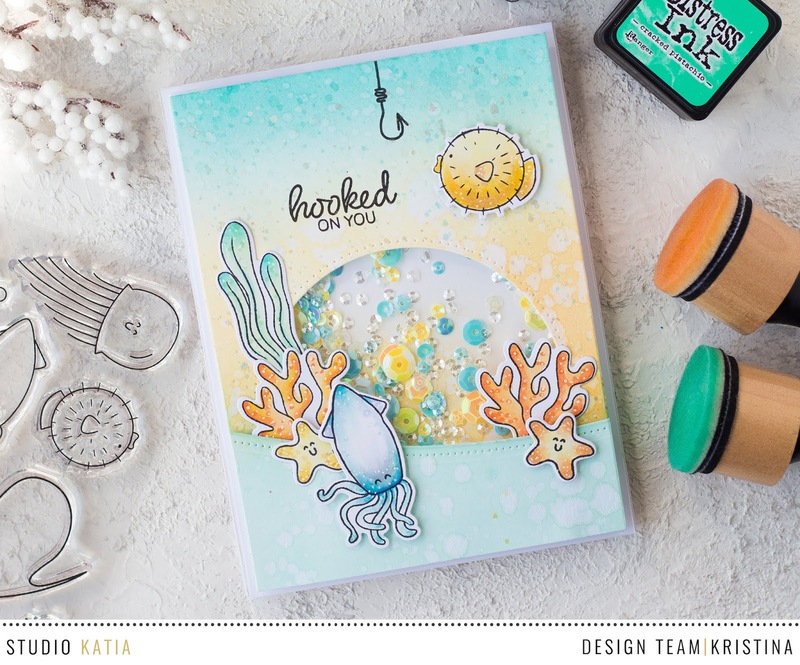 It's time for the Blog Hop celebrating Studio Katia new release and 2nd Birthday! This release includes 6 new clear stamp sets and 4 coordinating dies, 4 new stand alone Creative Dies, 2 stencils and new embellishments! To celebrate our new Release I decided to make a shaker card with brand new Under the Sea stamp set! I've started by stamping a few images from the set and colored them with Copic markers and also die cut with coordinating dies. For my background, I blended some mint, light blue and orange inks onto white paper and spllattered it with clean water. When it was dry, I splattered it again with the same inks. Next, I created a shaker window using die from Dotted Patterns: Scallop Square | Creative Dies set and filled the shaker with 3M Crystal Sequins, Radiant Pineapple Fusion and Enchanted Sea Fusion sequins. I also added light blue panel on top of my shaker base, that I die cut with one of Dotted Patterns: Simple Borders | Creative Dies set and stamped the sentiment with black inks on top of my shaker base. Next, I foam mounted the images on my card and my card is complete! You have arrived from Laurie Case and Kari VanNoy is your next stop. If you get lost you can find the full hop list below or visit Studio Katia Blog! Your card is so pretty! The background really complements the jewel shaker. I love the colors! I love the little white highlights on your coloring... what did you use? This card is sooooo sweet! Love the shaker and that puffer fish is so cute! I love your layering of colors and beautiful job of the coloring on the stamps. What a wonderful watery shaker! I have used up nearly all my blues and greens in shaker bits making cards and ornaments with my grands for the "other grandmother" who loves all things beach. But it has been a blast crafting with the kids. Needless to say, every time there is something that could be water on the clearance aisle, it goes into my basket! Thank you for another fun card using these adorable little fishies. Very pretty card, I like everything in this release. I love how well the colours go together! Love the design of your card! Such a sweet color palette also! Great card design! The colors are so beautiful and I love the splatters! Such a sweet card! I love your color choices, just beautiful! This is the cutest shaker card! Love these colors you used! Thanks for sharing! Gorgeous card!! I love the shaker part!! Just awesome!! The color choice in this card is lovely! Well done. Lovely card. Great design and layout. Love this set from SK! Congrats SK on 2 years! Love your stamps! Oh how I love shaker cards! And yours is great. Love your color combo on this card! Your cards are so lovely, especially the soft color palettes that you used! I love shaker cards, and yours doesn't disappoint! I love the colors you chose. Such a fantastic card..Love the soft colors you have used for the background..
Kristina, your shaker is so soft and pretty. The hook coming down is a great touch, what an adorable stamp set and the ideas for it is fantastic. Your card is really lovely. I do love the soft colours you used and how you "built" your window. Great job ! The colors on this card are amazing. Great design. Beautiful card and your background is so soft and lovely! I LOVE your shaker card! This is really cute, and it is so perfect for the summer! So cute - I love shaker cards! Love your shaker card! And the way everything is color-coordinated is beautiful! Wonderful card, love the colors. Amazing colors! This is a beautiful shaker card and the sea creatures are so cute! Gorgeous coloring and color combo on your beautiful card! Love the shaker card scene you created with these delightful sea creatures! I love the soft colors you have chosen for this card. What a cleaver way to use the items from this release! The colours you chose for your card are so wonderful - I truly love this combination! Gorgeous card altogether, thanks for the inspiration! Oh my!!! This is stinkin’ cute!!! Colors are really amazing!!! LOVE the shaker part! Your coloring is just spot on, and it turned out so perfect! This card is one of my favorites from the hop today! 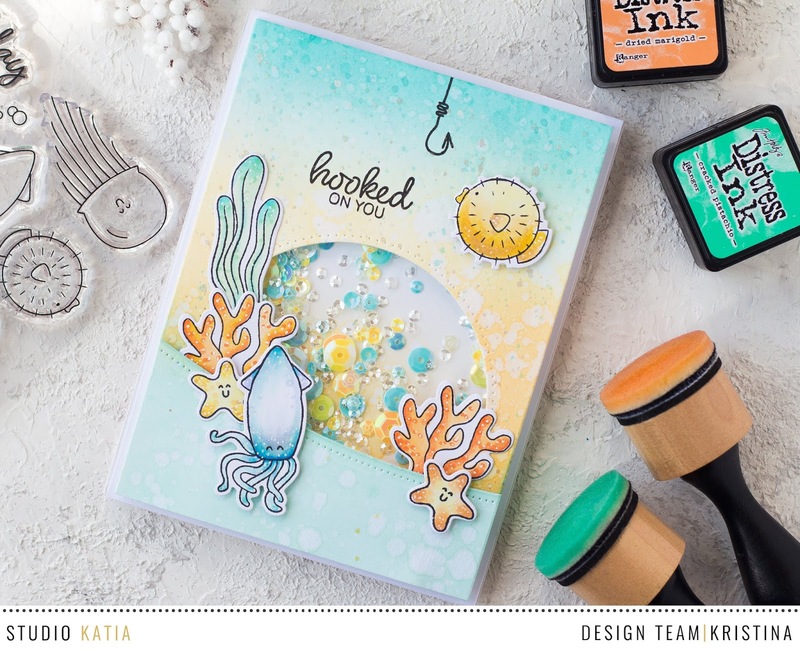 This stamp set was my favorite from the release and the card you made here is just SO stunning - from the colors, to the design, to the fun interactive shaker element I just cannot express to you how beautiful I think it is! WOW! Your shaker card is just fabulous. It is definitely my favourite card using this set. Not only do I love the shaker element which is so fun, but the scene you created and the colours you used on the fabulous background that you created is stunning. Such a fun and colorful shaker card! Love that inked background and the great coloring you did on the sea creatures! What a fun beautiful card! I love the background colors, sea critters and that you made it into a shaker! Love it!! Thank you for the great inspiration! I'm completely hooked on your lovely card; the palette...oh my! Swooning! Love the colour scheme, so lovely. You are very clever to get such a beautiful looking background. Congratulations. This card is lovely and fun. I love the colour palette. Kristina your cards always amazing. LOVE the soft colors you used! Beautiful shaker card. Love the soft colors and the beautiful background you created. Nice work. Your card is so beautiful. I had not thought to use yellow in a sea themed card before, but it works so well. Hi Kristina, your card is absolutely amazing. The soft colors you chose are so pretty. Who ever is the recipient of this card will cherish it forever. Thanks for sharing and the inspiration. Kristina, So cute! I love your cards! Kristina Your cards are so cute. I think I need this cute stamp set too! Adorable cards! Love that awesome shaker & the puffer fish is so cute! Beautiful card and I love the colors you used for the background. So fun with all the dimensions and the shaker too! Great job. Cute shaker design. I like these colors together. Wow !! How beautiful and cute is this card !! Well done ! I just love how you softly coloured all these wonderful images...your scene is perfect. Adorable shaker card! Beautiful color combo and composition. Such a pretty card, Kristina! Beautiful colors and ink blending. Love the shaker you made! 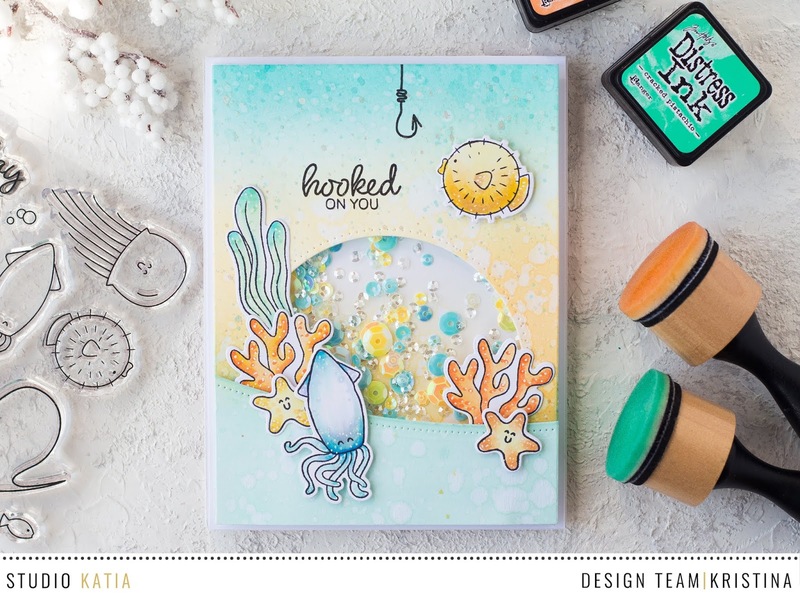 Really enjoyed this card and especially the fine coloring and speckled details on your sea creatures. Your overall color combination was fantastic and really springy. FABULOUS and thank you for sharing your creation with us. I love the soft colors! and ofcourse you cannot go wrong with a shaker! Wow! I love love love that color combination and your whole card is just awesome! It's the color choices that make this card so beautiful! I also love the shaker pieces! To die for! Gorgeous shaker card! I love your ink blending and coloring!!! So amazing! The more I see this set showcased the more I want it-which is totally the point I know. LOL. Anyway this card looks fabulous! I love the background with the lighter colors and the images are adorable. Shakers are one of my favorite things to make so I love that too. Aww...ur card is gorgeous and now I am hooked to your card...LOL...thanks for sharing!! Your colour palette is just gorgeous on this card. Love this ocean scene with the fab colour combo. This card is just awesome. Last year I had made such a DIY card for my mom’s birthday and she totally loved it. Now her 50th birthday is coming so I just want to make her feel even more special so would be throwing the surprise vintage bash at the prettiest home studios NYC.